The Ten Commandments of Mah Jongg! I have tried to find the original source for this very funny – but true! – posting. I found my way to the JewishJournal.com and then to the wonderful Mahj blogs on their site written by the prolific Mah Jongg “professor,” Elaine Sandberg. 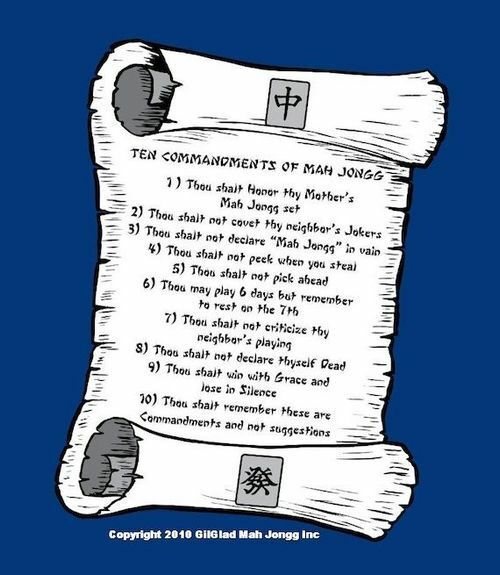 Scrolling through her blogs it would seem that our friends at Mah Jongg Madness are credited as the authors for these Ten Commandments. Or perhaps the Ten Commandments of Mah Jongg were just sent down by the heavens above! This entry was posted in Mah Jongg and Me and tagged 10 commandments, blogs, elaine sandberg, Jewish, journal, madness, mah jongg, prolific, ten on January 6, 2014 by Mah Jongg and Me.